Beautiful murals of the Taj Mahal and Indian wildlife adorn the walls of the Queen’s Star giving a truly authentic atmosphere. The owner prides himself on his traditional Indian cuisine, freshly prepared by chef Abin, who uses only the finest Indian spices to create a variety of subtle flavours. The Queen’s Star Specialities are extremely popular – all cooked in the Tandoori clay oven to chef’s own recipe and served in an iron Karahi. Established since 1979 and renowned for its excellent and friendly service. Open every day 4.30pm-12.30am. All major credit cards accepted (not Diners). 10% cover charge. 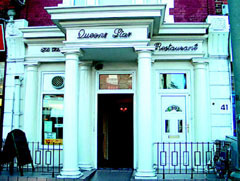 The restaurant has been established in Clapham since 1979 serving excellent Indian cuisine.